Lynne MclIrae was a lecturer of Bible studies at a Bible College in Johannesburg from 1986 to 1996. During that time, she was able to influence scores of female students who were preparing to serve as ministry wives (of pastors or other church leaders) or in other roles. Those students have since gone out throughout South Africa as well as others in different parts of the world. 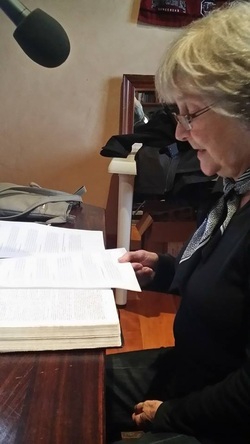 Lynne also worked with youth ministries at Calvary Baptist church in Randburg for many years, and many of those who sat under her ministry continue to be involved in their local church works. She is grateful for the ability to keep up with many via social media and see how God is using them in their adult years. Current resident of Knysna, she has also blessed area women with Bible Studies and with her faithful attendance in the local church. Listen now as she opens up the book of Ephesians and, using the 26 letters of the English alphabet, points out the Absolutes of God's Word. You can also hear her Words of Grace at 11h00 each weekday morning.